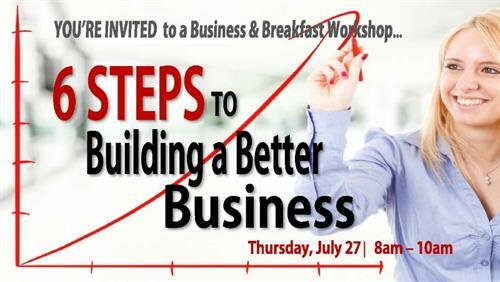 Business & Breakfast: "6 Steps to Building a Better Business"
Name: Business & Breakfast: "6 Steps to Building a Better Business"
· Are you overwhelmed by all the hats you wear? · Is your team getting in the habit of mediocre processes? · Is your business as profitable as you would like it to be? If you answered these questions and determined there is room for improvement, then this workshop is for you! ARE YOU READY TO MAKE A DIFFERENCE IN YOUR BUSINESS TODAY?